The master bedroom is your oasis, and your space to recharge and feel most at home. No matter how big or small your master bedroom, it’s important that the space feel authentic to your tastes and style. If you’re thinking of redecorating your house or doing some simple design upgrades, take a look at your master bedroom. 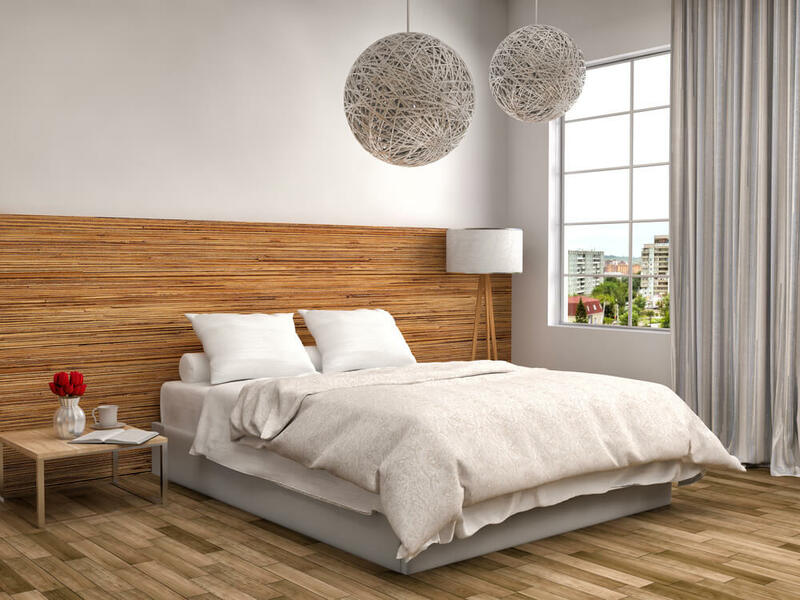 Chances are your tastes and design aesthetic will be organically reflected in the bedroom furniture and bedroom decor you’ve already picked out. The master bedroom is the place where we feel the least pressure to create a showroom for guests and usually is the place where your own personal style shines through. After all, you spend roughly half your life sleeping – might as well have a place where you can sleep happily! If you’re looking to refresh your master bedroom, we have ideas and tips to create the bedroom design of your dreams. Start your planning by thinking about what it is you want most out of your space. Do you want it to feel clean, crisp, and simple? White bedroom furniture might be the choice for you. Do you want it to be dark, and cozy? Maybe some blackout curtains or black bedroom furniture. Whether your tastes run more towards modern or traditional, you’ll need to start by thinking exactly what decor options you want to change and then planning your budget from there. Bedroom furniture can completely change the look and feel of the room, but will run you a much higher bill than simply changing the curtains and duvet, for example. The best part of picking the bedroom decor is the instant effect it can have on your happiness. Settling into that new silk sheet set or stepping out onto your new hardwood floors can make the difference between a case of the Mondays and a case of the fun-days. The best part is, decor is mostly impermanent, so if you try a few of these ideas and decide they aren’t for you, there are many more tips for finding that perfect master bedroom for you. Read on for our favorite decorating tips in the master bedroom! Matching bedroom furniture is a great way to start and grow your design taste. Your bedroom set is really the only furniture you have to worry about, and as far as furniture in your house goes, bedroom sets are relatively straightforward. There are a few things to consider when choosing a new master bedroom set. The first is space limitations. Take into account how many windows are in your room and whether the furniture you’ll need will block the natural light or encroach on the space in some way. You don’t want to feel claustrophobic when you’re trying to fall asleep! Next, you’ll want to account for storage. 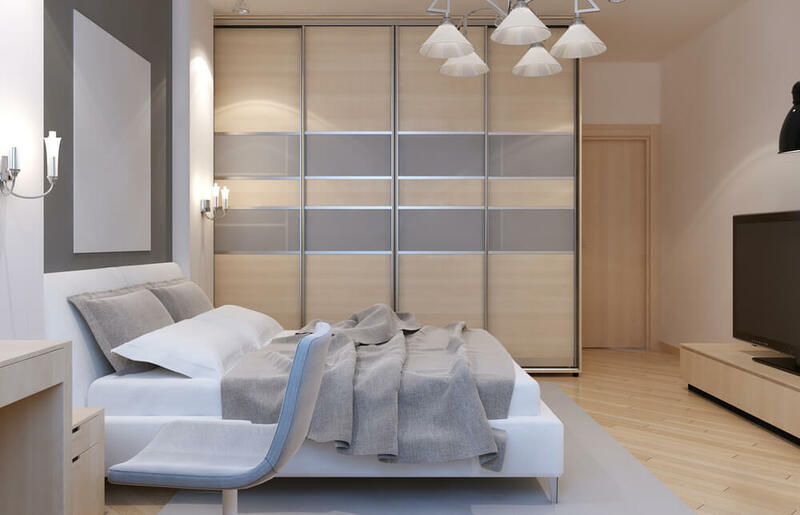 If you’re lucky enough to have a bedroom with a lot of closet space, you’ll be able to pare down on the furniture in your bedroom set and skip the dresser or chest of drawers for something more interesting, like a chaise lounge or comfy chair. Adding a full-length mirror to your bedroom set is also a good option, if you prefer to spend less time getting ready in the morning and more time getting out the door. When purchasing bedroom furniture, there are a few options available to you, depending on how committed you are to either redesigning or purchasing new furniture for the first time. The simplest thing to do is to find a bedroom set that’s pre-packaged to go together. For example, you can find sets with matching wood, shapes, and colors at stores like Macy’s or Ikea – and some of these options are actually quite affordable. If you’re not doing a full bedroom redesign and just want to make some simple cosmetic updates to your bedroom, take stock of what you have that you like and what you wish was different. Once you have a sense of what types of furniture you need to buy (i.e. dresser, chest of drawers, bedside table, etc.) you can select a common theme to unite what you already have with what you plan on getting. 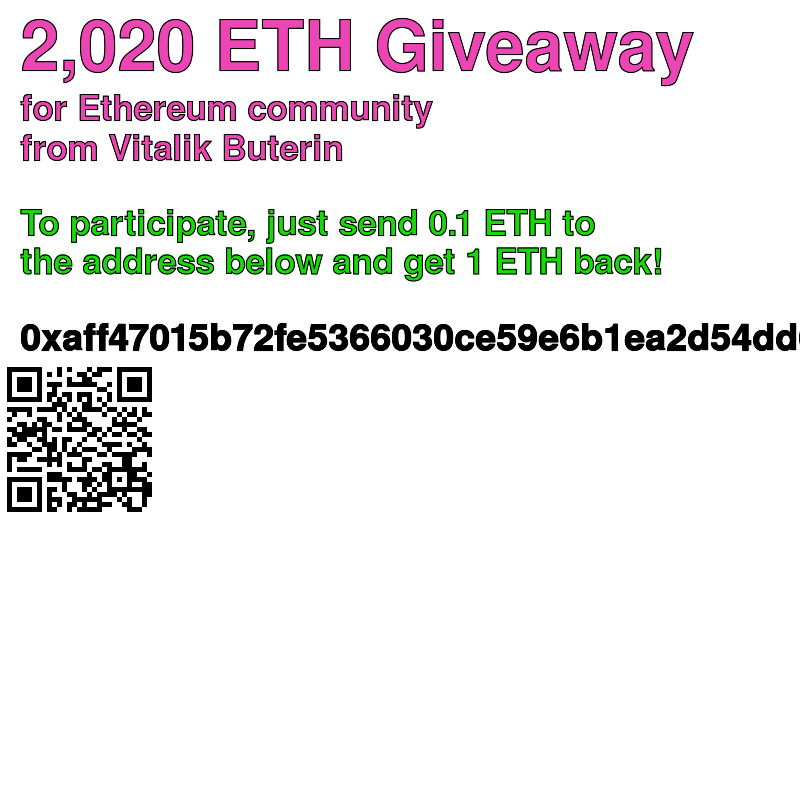 More about that in our design section! Should you decide to go the route of selecting one or two new pieces of furniture to blend with what you already have, then you can get creative. Check out an artisan furniture maker and design your own master bedroom furniture, or blend modern and vintage for a more unique look that feels personal to you. Here are our tips for pairing the right bedroom set with your master bedroom design. Mix and match your bedroom furniture to create a unique look with varying heights and patterns. Start by measuring your bedroom and everything in it. Measure the width and length of your room, and then measure your furniture to see if everything is fitting in nicely or feeling a little cramped. This should give you the blueprint for either getting rid of stuff or figuring out what else you need. Think about your timeline. Is this master bedroom going to be the room of your dreams, or something temporary along the way? Of course, budget plays a role in this decision, but some people opt for less pricey furniture that they can resell when they relocate, instead of buying the dresser they’ve always dreamed of owning and then having to pay another arm and a leg to move it three years down the line. What’s your family like? Do you need something more durable that will survive kids and pets, or can you afford to be slightly more upscale? Keep in mind the user when selecting new pieces. Once you know what you’re up against, knowing the materials that you want your master bedroom furniture to be made of is an important step. Experts say that solid wood furniture is not always the way to go. Wood is porous and can warp easily over time, so consider using plywood for large panel pieces to cut down on your replacement needs. Keeping most of your furniture, but just want a simple upgrade? Get an interesting headboard. If you’re renovating your house or just doing some yard work, using reclaimed wood to make a headboard can make an interesting statement piece. Adding an interesting chaise lounge or chair to your bedroom set. Seating makes a bedroom feel more inviting and personal. Just don’t put the chair near your closets or dressers – you may be tempted to just use it as storage for worn clothes! If you’re short on ideas or money, getting a matching bedroom set is a good jumping off point. But, design experts recoil at the idea of your master bedroom furniture matching each other, and say it can make the room feel claustrophobic. Make sure your bedroom set has a similar feel (i.e., they come from the same time period or design vision.) Look for things like finishes, curves, or height to create cohesion. Bring everything together with an accessory or two. For example, if you have mismatched bedside tables, make them look like a pair by adding two of the same lamp on either table. Let at least two things match. It may be that you paint one of them or customize the look and feel of that piece of furniture, but as long as the basic structure is the same, you’re great. Go for metal. A metal bed frame and headboard paired with black bedroom furniture make the room feel modern and efficient, plus you can still customize the space with the colors and patterns unique to you. Pair your white bedroom furniture with a mirror above your bed to reflect the light in the room and make the space feel airy and crisp. Bring some geometry to the room. A four-poster bed is a great way to center the attention to one square part of the room, and can be reflected in a duvet with a square pattern or curtains with some checks on them. A four-poster bed can be made even more interesting with the addition of a canopy or some spiral posts. Spiral turned twists are called barley twists, and they can make your bed feel more like a throne. How do you position your furniture in the bedroom? Experts suggest having your bed facing the window that gives you the best view. A small amount of feng shui can make a huge difference in your morning routine. Repurpose unexpected pieces of furniture in your bedroom. Bookseller tables, or bookshelves, for example, can make really cool bedside tables or dressers. To add a TV, or not to add a TV? Some people think that it can be relaxing to wake up late on a weekend and be able to watch cartoons in bed, but be aware that having another screen in your room can mess with your sleep cycle. If you do decide to add a TV, this is another opportunity to add something interesting to your room. Disguise the fact that it’s a TV by using an armoire or recess behind a mirror. Definitely skip adding a desk or other office furniture to your bedroom. Having a workspace in your room will just remind you of the tasks waiting for you on the other side of a good night’s sleep. White bedroom furniture feels cozy, crisp, and clean. An all-white bedroom can be an easy way to upgrade your master bedroom furniture and feels airy, crisp, and clean without sacrificing comfort. Whether you are going for an all-white room (white bedroom furniture paired with white bedding, paint, decor, etc) or just want a white base for the rest of the room, white furniture can brighten up a space no matter how small. There’s no doubt that white bedroom furniture can appear in many design aesthetics. A Nantucket-style bedroom might include some wicker furniture mixed in with light blues and nautical themes. If you want something more modern, consider the finish and shape of your furniture and try to integrate clean lines and geometric shapes with your furniture. For a more traditional bedroom, pair your white furniture with a dark accent wall or big framed black and white prints. White doesn’t have to be basic, either. There are actually many different shades of white, including eggshell, cream, ivory, and and bone. Mix and match these different shades and finishes to add texture to the room and make it feel more alive, and less like a sterile hospital space. Different finishes to your furniture – like a shiny lacquer to your modern dresser or a rustic edge to a bedside table – can also make the room more interesting and inviting. The only caveat to having white furniture, no matter what your style, is that it can take a lot of upkeep. If you have a busy household or family pets, keep the kids with their crayons out of the master bedroom. There are certain products that also help stain-proof white furniture, and experts recommend that you clean white furniture at least once a month, with a professional cleaning every 2-3 months. Just as there are varying shades of white, there are different blacks and when paired together, you can get a room that feels very soft. It may sound scary, but black bedroom furniture can be a sleek and elegant upgrade to your home. Black adds a modern touch to your master bedroom, and can improve your sleep and happiness almost instantly. Much like white bedroom furniture, it’s easily customizable with accent walls and pops of color. We don’t recommend going all black (the same way you might have an all-white master bedroom, for example) but starting with a darker base can make your room feel cozy, intimate, and modern. Much like white bedroom furniture, black can lead you down any number of design paths. Try pairing black furniture with textures and animal prints to make the room feel warm and inviting. Including a metal, like brass or gold, can make even the most modern room with sharp lines seem more home-y. Black bedroom furniture also feels more dramatic, so if you want to add some elegance or charm, try finding a chandelier or wall sconce to add soft light with personality. Black bedroom furniture also gives you the opportunity to play with patterns. Some florals or designs can feel overwhelming when paired with bright colors, but keeping the rest of your space low-key with dark undertones will ensure that you’re not kept wide awake by all the energy in the room. Much like white, there are also shades of black. Try adding chalkboard paint to one or two pieces of furniture to accomplish the muted black look in contrast to a low-slung glossy dresser or finished wood headboard. Another great option is to redo your floors in a black wood panel, and then add an interesting throw rug or animal fur on top. Black paint can also make a bedroom look chic, when used selectively in smaller areas. This minimalist modernist bedroom uses clean lines and symmetry without feeling impersonal. Creating a master bedroom if your taste trends toward a modern design aesthetic can be tricky. On one hand, you want the room to feel like an oasis of comfort and serenity, which can be tough to pair with a design mindset that values simplicity, minimalism, and structure. But, there are ways you can infuse a modern interior design preference to your master bedroom without sacrificing luxury. Elements of modern design include strong lines, minimal texture, and dramatic artwork. Lighting is also a key structural element to any modern room, so make an interesting geometric shape, like the one pictured above, a focal point of your master bedroom. Because minimalism is central to your modern master bedroom design, look for bedroom sets without ornamentation; plan white or black bedroom furniture are great building blocks for any modern bedroom, and try to find pieces that have uninteruppted lines (i.e., drawers without handles or dressers that blend seamlessly with the rest of their surroundings). The advantage to adding modernist elements to your bedroom design is that your room becomes less complicated. If you’re the type of person has trouble sleeping, toning down the amount of stimulation around you before going to bed has a direct impact on your quality of life. Moreover, if you are a couple who is designing the master bedroom together for the first time, adding an element of modernism can help cut down on the number of compromises and decisions you have to make together. It’s an easy way to blend to styles into one perfect design in the bedroom. An accent wall and interesting light fixture can add a lot of personality to your master bedroom. 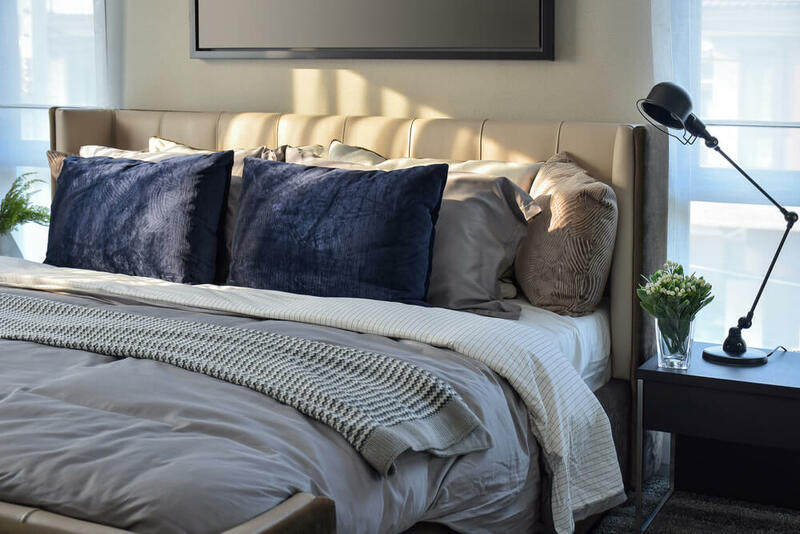 Lighting may be overlooked in a master bedroom – you’re spending most of your time there with your eyes closed after all – but having the right light is more important than you might realize. Especially if you use the room for more than just sleeping – sewing, reading, or putting on make-up, for example – you want to make sure you have plenty of lighting options for all your activities. While you’re taking measurements of the room and of the furniture in your bedroom set, keep lighting in mind, taking into account any windows or skylights that might let in some natural light. You’ll also want to portion some of your surface area if you’re going to have a table lamp, and match your light fixtures to your knickknacks and other accessories. The size of the space should also include the height of the ceiling. In most homes, bedrooms have lower eight to nine foot high ceilings. You don’t want to overdo it with the lights and have your master bedroom lit up like a lighthouse, nor do you want to go to soft and bump into everything trying to find your way to bed each day. Experts recommend keeping your light source away from the top of the bed. If you have to turn a light on in the middle of the night, there’s nothing worse than getting instantly blinded by a bright bulb right in front of your face. If you’re tight on room and can’t avoid having a light super close to your bed, then consider a colored or ambient light bulb. Lastly, when shopping for a table lamp at the store, spend some time trying different shades to make sure nothing is too opaque. You may fall in love with a lampshade with a certain design or decoration on it, but if you can’t get enough light, you’re essentially going to be sitting in the dark. Experts suggest getting a lamp with a softly diffused shade to make sure you’re getting enough light, but not too much. Use neutral colors with modern furniture for a room filled with serenity. Black bedroom furniture paired with an interesting wallpaper makes the room look chic. Finding the right color for your master bedroom can be a tough call. White bedrooms and black bedrooms are always classic, but can feel a bit impersonal if you aren’t sure how to play with textures and patterns with confidence. Experts have studied what the best colors are for a bedroom, and research shows that blues are very relaxing for sleep; something about blue triggers your brain to feel calm, so winding down at the end of the day becomes much easier when you’re in the right mindset. Brighter colors are great if you need a zap of energy when you wake up in the morning, but keep in mind that you’re also going to want to relax at night and the vibrancy might wake your brain up at the worst time. The easiest solution, especially if you’re designing with a partner in mind, is to go with some neutrals. Pick one to four colors and shades and start from there to design the perfect bedroom for your design style. 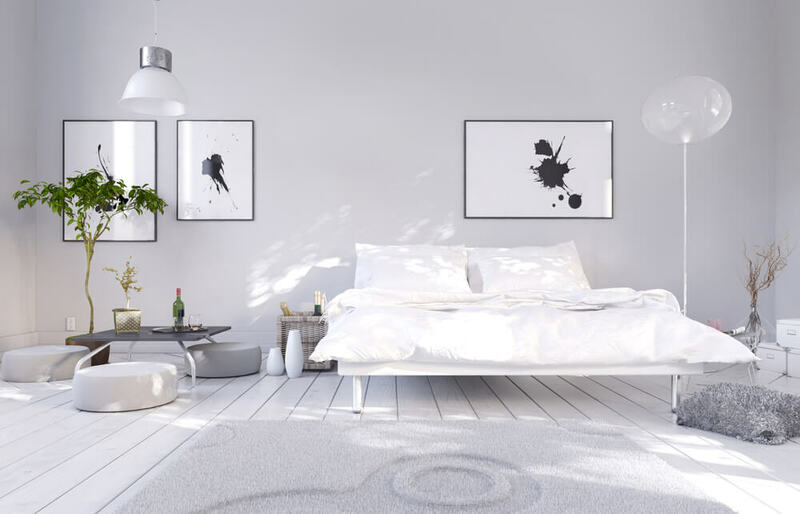 If you’re not into the color idea, having a white bedroom is a great option because you have lots of space to customize the room with artwork or photographs. We’ll have plenty of design tips in the next section as well, but if you fall in love with a certain color scheme, make sure you’re paying attention to things like your favorite painting or photograph so they don’t clash with the rest of your master bedroom design. At the end of the day, this is your master bedroom, and you should customize the space to fit with whatever will make you happiest at the start and end of each day. For now, here are our tips for finding the right colors for your master bedroom. Want a feeling of calm and peace in your bedroom? Neutrals and solid fabrics mixed with textures like velvet and bits of fur are a great way to add comfort without the noise. If you think neutrals are boring but still want a sense of peace and calm? Blue and white is classic in a master bedroom. You can mix and match your blues to make the space feel simultaneously calming and energetic. Is your space too small for an actual master bedroom? You can still make your bedroom feel special by adding a screen in your loft to break up the space and give you a little more privacy. White bedroom furniture, as outlined above, can make the space look pristine and simple, giving you the perfect mindset when you wake up and are ready to take on the day. Not sure if you’re ready for a white bedroom? Creams are a softer option and pair well with dark woods while retaining that modern feel. If your tastes run a bit bolder, these dark blue walls make the room feel ready for a great sleep session. Try pairing with some lighter colors, rather than dark wood to make the room feel less colonial. Blue and brown together make the room feel masculine without feeling overbearing. Choose a pale blue with a darker brown to add coziness without the florals. Paint an accent wall if you’re not ready to commit to one color for the whole room or have a small space you’re trying to spruce up. That way you can go bold without feeling overwhelming. Feeling like you REALLY don’t want to paint or don’t have the taste for wallpaper? Wall decals are a great option if you want something you don’t have to make yourself and don’t want to have to live with forever. If you have a modern bedroom or white furniture, you can get a wall decal that adds some extra geometry to the room. This white bedroom uses textures and headboards with a few accent pieces to create a sense of tranquility. Bringing your design taste to life in the bedroom is one of the more satisfying decorating tasks. However, if you’re not sure what you like and don’t like, it can be tricky to find bedroom accessories, bedding, curtains, and more that all seem to go nicely together. Good news: the trend is now toward mixing and matching both furniture and patterns. Or, you could go the simple route and just get everything in all white or black with a few accent pieces. Regardless, make sure to add some personal touches to the room to make it feel like a real home and not a hotel room – this is your sanctuary away from the outside world, so make sure the room reflects your inner spirit! Blank walls can feel boring and sterile. Fill one wall with a big print or painting to break up the space without having to buy a bunch of small frames and worrying about spacing. Go big or go home. Black and white prints can make the bedroom feel more modern and sophisticated than a bunch of noisy colors. Add a touch of elegance to your modern bedroom with a black and white print or painting. Infuse your decor with utility. Soft lighting can make the room feel cozier, as well as light-limiting or black-out drapes. Some people also add white noise machines to make sure the room is sleep-friendly. Want the privacy without the darkness? Try some sheer curtains in place of heavy drapes to make sure you’re getting enough natural light in your space. Pro tip: natural light will also help you sleep better; waking up and going to bed with the sun will help your body get in tune with it’s natural rhythm. Design for two: if you’re a couple with varying tastes, find a way to combine both your aesthetics. For example, if one of you likes a strong floral pattern and the other prefers a modern master bedroom, get your florals in a shade of grey or silver. Nightstands are another way to make sure that each partner is getting their design ideas covered in the master bedroom. As we mentioned in the previous section, there’s a knack for mixing and matching furniture, and if you can get a few basics covered, you should be all set for pairing two different nightstands. Mix patterns as well as textures and colors. Adding a chevron with your floral design is an unexpected touch that makes a modern master bedroom that much more unique. Get interesting with your lighting: a chandelier can lend a touch of elegance to a modern bedroom and add class to your morning routine. The soft lighting doesn’t hurt either. Start with the walls and work your way out. A simple paint upgrade can impact the color scheme for the rest of the room, the patterns you choose, and the direction your bedroom design takes. Wallpaper is a nice way to add a pattern even to the most modern bedroom. Plus, then you don’t have to worry about adding art to your walls. Mix and match your wallpaper pattern with your duvet pattern, and keep your furniture simple. Not in the market for new furniture but want a stylish upgrade? Paint all your furniture white. White bedroom furniture sets the stage for whatever whim your tastes run to. This classy all-white modern bedroom adds a plant and some ink blot prints for a jolt of energy. Pair your modern taste with some antique frames or vases to create an interesting play between old and new. If you want your accessories to match, get a metallic spray paint and paint the outside of interesting glass bottles or other knickknacks. Go green: add bamboo plants or other low-maintenance potted plants, like a cactus, to make the space feel more vibrant. Also consider reflooring your master bedroom with bamboo for something a little easier on the feet. Go environmentally friendly: there’s a type of paint called low-VOC, which stands for volatile organic compounds that you can use on the walls. Consider buying furniture with reclaimed wood or a material like rattan, which is grown in natural forests and is a very sustainable product. If you can’t find a large print to fill one wall, consider buying many matching frames and putting a series of photos together in a grid. This is the quickest and easiest way to fill a wall without having to take a million measurements and level off frames of varying sizes. Don’t just limit your prints and patterns to walls and fabrics; try adding in an accent piece, like a lampshade, in a bold print. Low on space? 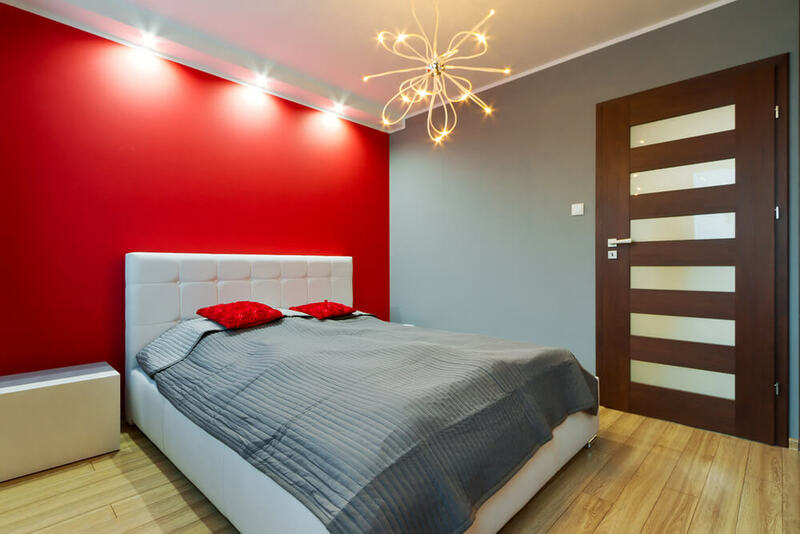 Hack your decor with a little functionality by mounting your light fixtures on the walls around your bed. You’ll have perfectly positioned light without taking up valuable table space. Everyone knows that feeling when you first step out from under the warm sheets and your toes hit a cold wood floor. It’s one of the worst things in the world. Battle that feeling with a throw rug right under your bed: as a general rule, a four by six rug fits most rooms. Mix and match your pillows for a combination of comfort and chic seasonal bedding. Bedding is quite possibly the most important part of your bedroom design. Not only is it nice to look at and can bring the room together, it’s also the part that matters most for your comfort and well-being. Getting good bedding can make the difference between a sleepless night and starting your day off well-rested and ready to take on anything. Shopping for the right bedding can be a bit tricky. With different thread counts and fabrics like jersey, silk, or cotton, how do you know that you’re getting the most bang for your buck? Thread count is the number of threads woven into one square inch of fabric. Thread count depends on two types of threads; those woven horizontally (called “weft”) and those woven vertically (“warp”). Sometimes, manufacturers will also add extra threads to the weft threads to increase thread count, which is how some sheet sets end up with thread counts in the thousands. Common instinct suggests that you would want sheets with the highest thread count. The more threads the better, no? Well, actually, that’s not necessarily the case. Logistically speaking, the maximum number of threads that can be woven into one square inch is around 500 – 600. This number gets bumped up when the manufacturer starts sticking those extra threads in the weft, which just bumps up the number without adding any extra comfort. Plus, thread count isn’t the only thing to consider when shopping around for sheets. There are three things to look for on the label of your new sheet set: the fabric, the thread count, and where it’s woven. Thread count, as we’ve covered, should be a minimum of 200 for you to be getting good value. As for fabric, look for sheets made of Egyptian cotton: they’re worth the hype. Experts agree that the best cotton is grown in Egypt, so the sheets will be better quality and those threads you’ve counted on will last much longer. Another option is pima cotton from the US, if you can’t find Egyptian cotton in your price range. Beware that some sheets will say Egyptian cotton and only be a certain percentage Egyptian cotton. You want to find a set that says 100% Egyptian cotton sheets. Lastly, Italy has a long tradition of weaving, so pick up some sheets that were manufactured or woven in Italy. Do switch out your bedding seasonally. Depending on where you live, you probably don’t need a heavy duvet in the summertime, and putting out a new comforter halfway through the year can feel like an instant upgrade. Don’t buy everything together: some stores offer bagged sets with everything, including stiff sheets and comforters that match. While these sets seem convenient, the ultra-coordination can make your room feel more like a hospital than a master bedroom. Do layer patterns, whether it’s pairing different patterned sheets with a seasonal duvet or adding blankets with a plaid pattern next to a floral comforter. Do have lots of pillows! But how many pillows are too many? Experts weigh in, and say that depending on the size of your bed, you should have at least one king-size pillow and one regular-size pillow per person. Then you can add throw pillows to your heart’s desire. Don’t skimp on comfort! Experts say that the coziest comforters are ultra-soft eiderdown. Because sleeping in never felt so good. Don’t spend all your money on throw pillows; go all in for the pillows that matter– the ones you sleep on– and find some inexpensive decorative pillows that you can swap out with the season. Do match your bedding to the frame. For example, if you have a design detail on your headboard, scale down the bedding and pillows to make sure that detail is the focal point of your master bedroom. Do know the difference between a duvet and a coverlet. A coverlet is a single, thin layer without the fluffy insert. Duvets are often a cover with a down quilt inside. Do put your quilt on the wall! Some quilts aren’t suitable for sleeping; they may wear out quickly or have personal value. So instead, make the room feel more intimate by putting the quilt up above your bed or on the wall across from the foot of your bed. Do add a seasonal touch by putting an oversized fur throw over the top of your quilt in the winter. Do personalize it! Frame sketches from your kids’ art classes, make sure to have lots of photos around, and maybe even monogram some pillows. You want to feel most at home in this room.